Whether as frontwoman for her heavy metal band 69 Chambers or as a journalist, Nina Vetterli-Treml goes her own way—without beating around the bush. In Zurich the Swiss superwoman stands out, and not only when she steps out of her 911. According to Plato, love is a kind of madness. Euripides says that of all illnesses, love is at least the healthiest. Stressed out, because my week has too few days and my day has too few hours. The most rational way to be irrational. Petting my fat cat Gino. Pick my nose. I always wonder what makes some people feel like they’re not being observed while sitting in a beautiful car. 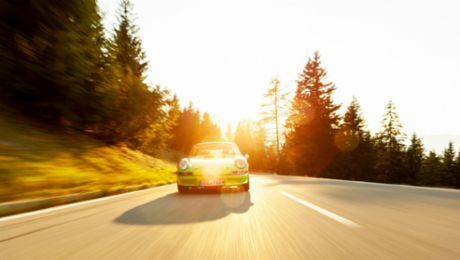 Any road that my 911 and I have to ourselves. Traffic lights, reduced speed zones, and cars that block passing lanes. A guitar, a good book, and—assuming the island has paved roads—my car. Beautiful writing. Every once in a while I run across sentences that make me jealous that I didn’t write them myself. Electrically adjustable seats, driver assistance systems, and a convertible roof. The roar of the flat-six engine and the view of the front fenders. None at all! I’m not a morning person and just want to be left in peace. I’m more of the TV series type. Lately, The Book Thief by Markus Zusak. That had to do with my rock band’s concert in South Korea. As it happens, my 1980 Porsche 911 SC. As someone who’s not a morning person, there’s only one answer: coffee! Some years ago, I drove my 911 to southern Germany for a 911 GT3 991 series media event. Over seven hundred kilometers on the loveliest country roads with the two best cars I know. Relax! Not that I take my own advice. People expect just about anything from me, whether positive or negative. While taking his 1979 911 SC out for a spin, Kavka talks about his special relationship with Porsche.